Hello to my lovely readers, I hope you are all well and enjoying this nice warm weather! I have a quick review for you and then a competition, see I thought I saw your ears prick up then ha ha! 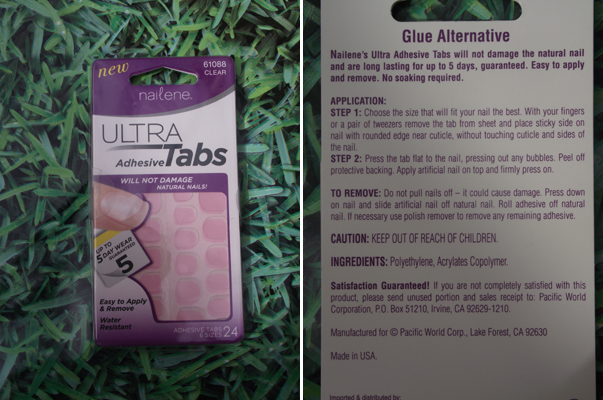 I was very kindly asked if I would like to try Nailenes New Ultra Tabs which are an alternative to glue. Yes that that's right no glue needed to apply your false nails. I found this really interesting to use because I have sensitive nails which have not be in very good condition until lately so I was a little dubious whether or not to use these. However as they claim on the pack these will not damage your natural nails I thought I would give them a chance. I have worn these and took them off so I could see how they left my nails underneath, luckily I can say my nails are just as they were before so no damage which is excellent news! I am right handed so I had no problems applying them to my left hand however trying to do my right hand was a little tricky so you may need a helping hand. I have quite big nail beds and felt that the thumb tabs could've been a little bigger but otherwise they were fine. Don't these look so pretty? I had to take the photos on my beautiful roses which my husband bought me for our 2 yr wedding anniversary! Nailene nails look so natural, these are the Short version which I happen to like as they are very manageable especially with little children to look after. Sadly mine did not least the 5 days, I am heavy handed anyway so I knew these would only least a few days but anyway the days they did last was still nice. So would you like to win a pack of these lovely nails and a pack of their New Ultra Tabs? I have 5 sets to giveaway so do you fancy having some lovely talons then please follow the rules below to enter! 1. Please leave a comment below saying 'Enter Me' ONLY ONE COMMENT PER PERSON! 3. You must be a follower of Mirror Mirror On The Wall through Google Friend Connect, you can follow by simply clicking on the 'Join This Site' button ( On right side of blog). 4. Lastly please leave your email address so I can contact you if you're one of the five lucky winners! I will be running the competition for 2 weeks, ending on Saturday 13th August. I'm on GFC & Twitter as Faeribex & follow both you & nailene. Hi Sherrie, enter me please :) These look fab! I am a follower of your blog GFC name Saz. I follow Nailene on twitter as @Selene1611. I am a follower via GFC as Emma Robinson.